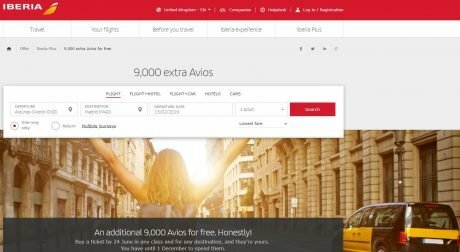 You can still use the Iberia 9,000 Avios promo for booking a one way flight on Iberia, Iberia Express, and Air Nostrum. The deal ends today. When today? Your guess is as good as mine. The time in Madrid is EST + 6. Do they mean June 24 local time, ET, PT, CT? The promo can end any time, but at the time of writing, the fat lady hasn’t sung yet. Each individual can get up to 90,000 Avios for booking up to 10 flights, and you must spend your Avios by December 1, 2018. I can see how some folks must’ve rounded up their friends and loved ones to scale the deal. Me? I’m against the crazy and all for the lazy. I have a few hundred thousand British Avios, so when I saw this deal on Friday, I decided to sit it out. But.. This morning I caved in. The peer pressure got to me, and besides, I remember my flight in a great Iberia Business Class seat from Madrid to JFK I took last year. It was much better than the American Zodiac seat from JFK to Barcelona. A roundtrip flight between New York and Madrid costs 68,000 Iberia Avios and ~$200 in taxes and fees. This is a steal, and this is what I aimed at. I bought 8 one-way Iberia tickets to get to 72,000 Avios. I also charged the bookings on my Citi Prestige card to get some money back — I think I have only used up about $120 of my $250 annual airline credit. The Iberia 9,000 promo is a great opportunity, so if you feel like making a last-minute run for it, you still can. True, Iberia has raised the airfares across the board, but there is one thing that can help. 2 days ago Santander — Madrid would sell for 24 Euros oneway, but people have booked it so much that Iberia’s algorithms have probably decided it’s about to become the hottest Spanish destination and adjusted the airfare accordingly. So the cheapest ticket I’ve found today is from Oviedo. Never heard of it, but I’m sure it’s a lovely city, regretfully, one of many lovely cities, I’ll probably never see. It currently sells for 27 Euro. If you see higher fares, try the Incognito mode to book your flights. Just right-click this link here and open it in the Incognito mode (or In-private or in any other private browser you might use), or try to use VPN perhaps, well you’ve got the picture. The American Express Platinum card won’t work for this deal, but the Citi Prestige or Chase Ritz Carlton will. The Citi Prestige will reimburse you up to $250 for any charges originated from the airline. It’s very straightforward and automatic, you don’t have to do anything. Getting reimbursed by the Chase Ritz Carlton card is trickier. You have to call and explain that this was an “auxiliary” charge (in a large scheme of things it is because you’re most certainly not going to take these flights 🙂 ). People complain a lot about the Chase Ritz Carlton reimbursement policy, but I always got all my credits back when I had the card. Will they honor the deal? Everything we know so far indicates that they will. They specifically mentioned that you don’t have to take the flight(s) you’ve booked (they promise the bonus within 9 days after the booking). Of course, the level of enthusiasm from the hobbying community might be a bit overwhelming to any company, but this is not 2010. Everyone knows about travel hackers nowadays. It’s naive to think that Iberia couldn’t have envisioned the response they would get by selling their Avios for ~$0.33. But even if Iberia reneges on its promises, I believe, the risk of losing our money is low. I can’t imagine that a major airline wouldn’t refund the money, so the only thing we could lose is time. In my case that would be about 1 hour. Does it mean there won’t be any catches? I’ve never said that. To me, this extremely generous promotion means that the Iberia Avios devaluation is almost upon us. Which means, you shouldn’t wait until December 2018 to make your booking — book as soon as you can. If I’m right and Iberia is going to devalue, they might or might not give us some grace period. But even if there is a grace period, Iberia can just take the best sweet spots out of circulation. Nothing is guaranteed, so don’t procrastinate and book as soon as you’re ready after you get your Avios. Clip and save the first page stating the Iberia 9,000 Avios bonus that indicates your date of travel. If you book multiple flights, save all those pages. I can’t even begin telling you how many times saving things has helped me to win an argument. It might be completely unnecessary in this case, but who knows! And it only takes a few seconds, so it’s not even worth debating, I think. Have you gotten in on the Iberia 9,000 Avios deal and how are you going to use the Avios? I lived in Oviedo for a year and I love it there. I’m headed to San Sebastian this November and sad I’m not going to make it to Oviedo. Thanks for your comment, Julie, and it’s good to know about Oviedo. Regarding San Sebastian: I don’t know about November, but I was there last August, and it’s a seriously gorgeous place.